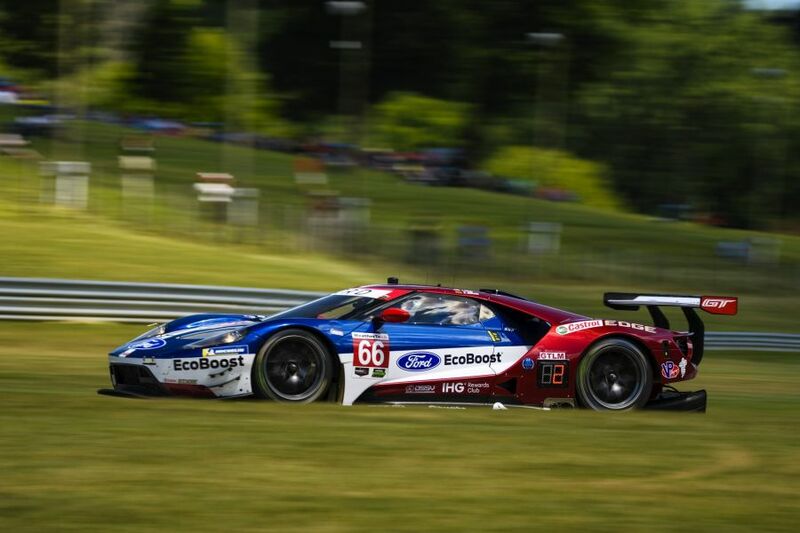 Dirk Müller and Joey Hand scored their second win of the season in the #66 Chip Ganassi Racing Ford GT in the Northeast Grand Prix at Lime Rock Park, the eighth round of the 2018 IMSA WeatherTech SportsCar Championship. The race at 1.5-mile circuit has been opened for GT cars only, the Prototypes has a rest for the first time this year. It was the third consecutive IMSA GTLM win for Ford Chip Ganassi Racing. The #3 Corvette C7.R of Jan Magnussen and Antonio Garcia was the fastest car in qualifying and led for the most of the race (150 laps) on a way to historic 100th IMSA victory for Corvette Racing but Joey Hand spoiled a celebration by passing Magnussen with 13 minutes left on a clock. Until the end of the 178-lap race, Hand built an advantage of 11.431 seconds for his second win this year after a triumph at Watkins Glen. Earl Bamber and Laurens Vanthoor completed the podium in the #912 Porsche 911 RSR. 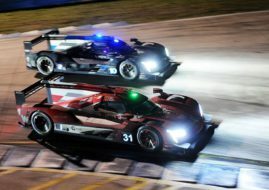 On the top of the GTLM standings, Hand/Müller have 208 points with Garcia/Magnussen following closely (207 points) and Ryan Briscoe/Richard Westbrook third with 206 points. Madison Snow and Bryan Sellers also stepped onto the top podium spot for the second time this year by winning the GTD class at Lime Rock Park in the #48 Paul Miller Racing’s Lamborghini Huracan GT3. Their first win was at Sebring 12 Hours. Five different cars were in the lead during the race at Lime Rock Park but the #48 Lamborghini was in front for the final 63 laps and took the win ahead of the #44 Magnus Racing Audi R8 LMS of Andy Lally and John Potter. Gunnar Jeannette and Cooper MacNeil finished third in the #63 WeatherTech Racing Scuderia Corsa Ferrari 488 GT3. With six podiums during the season, including two wins, Sellers and Snow extended their lead in the GTD standings to 10 points (218-208) over Katherine Legge, who finished fourth on Saturday in the No. 86 Meyer Shank Racing Acura NSX GT3 with Alvaro Parente. The next IMSA SportsCar Championship race is the Continental Tire Road Race Showcase at Road America on Sunday.